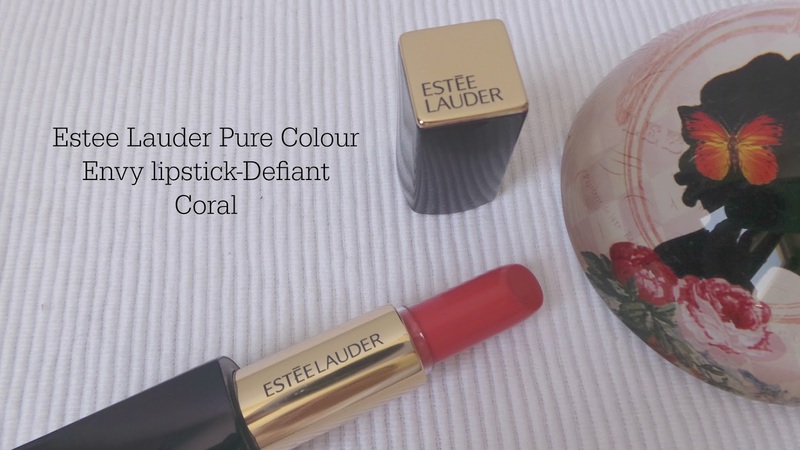 I was asked by one of my twitter followers (hi Patricia) if I had tried any of the new Estee Lauder Pure Colour Envy Sculpting lipsticks and I remembered that one of my very dear friends bought one for me for my birthday, so especially for Patricia here is the review of the one I received which is the shade Defiant Coral. If we wanted to keep this a short and snappy review I would say 'this is a great lipstick' but as I am not really one for short and snappy I will ramble on a bit about why I like it. Firstly the packaging is really nice in navy and gold. The casing has that satisfyingly expensive feeling magnetic 'click' closure and the Estee Lauder embossed into the lid is a nice touch. Definitely one you wouldn't mind whipping out in public. Estee Lauder describe this lipstick as intensifying, hydrating and sculpting. I guess by 'sculpting' they mean defining and plumping which I have to agree with. The new range comes in 21 colours and my friend Sylvia bought me 'Defiant Coral' which was a brilliant choice for a coral lover like myself. I found it quite hard to describe the feeling of this lipstick-it's not overly waxy or syrupy or even gel like. In fact it feels really lightweight, almost akin to a balm. But yet it's super pigmented, ultra smooth to apply and opaque in one pass. It feels creamy and hydrating but without any heaviness and without any bleeding into little lines. Overall I am really impressed with this new offering from Estee Lauder and I have already got my eyes on another shade 'Tumultuous Pink' from the range! They're £24/$30 from all Estee Lauder counters. Defiant Coral is so pretty on you!! I have been itching to add a new summer color into my lipstick stash. Next time shopping Estee Lauder counter will be my first stop. This looks soo lovely on you! That's such a rich and gorgeous reddish coral! I love how even, smooth and moist it is! I just got one of the red ones, still playing around with it but it seems nice so far :) This one looks lovely on you!